Driving in Mexico, particularly the state of Quintana Roo, is really very easy and nothing to be intimidated by. There are a few things that are unique and different that foreign drivers need to be aware of. But for the most part, it’s very similar to driving in rural or small cities in the US. If you are aware of these nuances, the ability to drive yourself around will make your experience in Mexico much more enjoyable. The most important part of driving in Mexico is to be properly insured by a Mexican Insurance Company. No matter what your American insurer, or your credit card company might tell you, you will still want Mexican insurance. When an accident occurs in Mexico, the fault is determined at the site by the police, and financial responsibility must be proven before the guilty party can leave. Your US insurance might very well eventually cover the accident but until it is proven to the police, (and remember, you are the foreigner) you are not allowed to leave the site or police custody. Your US insurance coverage card will not be sufficient. The reason the police will let you leave if you have full Mexican coverage, is that Mexican insurance comes with the assurance that an adjuster and attorney will actually come to the site if requested by the police, to act on your behalf. When a tourist shows the full coverage with their car rental agreement, the police are satisfied that the other vehicle is covered and you will not be detained. But if you do not have this coverage, you will be liable, under Mexican law, to cover repair, medical and disability of the other injured party, and you and your vehicle will remain in custody until that is done. Most rental car companies offer the necessary coverages, and depending on the rental company’s standard coverage, will add $15 to $50 a day to your rental costs. A small price to pay to assure your vacation isn’t ruined because you had to stay in a Mexico holding cell while your US agent works things out for you. If you are going to drive in Mexico, you need to be aware or the biggest rip-off in all of Mexico, the guys at the Pemex gas stations. Seems no matter how hard you try, you still get taken by these guys, so get ready. The most typical trick is to not reset the pump from a previous small purchase and start your pump with that amount already on it. The chances are, you’ll never know because it is a rental. Often, if they see you about to pay with a $500 peso bill, about $40 US, they will have a $50 bill, which looks similar and could easily be confused by a foreigner, in their other hand and tell you you only gave them the $50. As the unsuspecting foreigner, you usually think it was your mistake and give him another $500 peso bill. They have a million of them, so be ready. Make sure you see all zeros on the pump before they start, ask for specific amounts to avoid the change ripoffs, or if you fill up, count the money as you hand it to the attendant, so there is no “misunderstanding”. So what is different about driving in Mexico? It would be best to begin by saying what will be familiar. Most of the road signs will be easy to understand such as stop signs and road markers. Speed limits are also easy to understand, although some might be a little confused at first by the metric system used in Mexico. Your car’s speedometer will also be metric so don’t worry, you’ll know if your going too fast. Signs, in Spanish of course, are the large reflective type seen on the highways in the US and very easy to see and read. And like in the US, you drive on the right side of the road. There is one main highway (307) that runs along the coast of Quintana Roo and serves as the main traffic artery of the area. It is a new concrete highway and marked like most highways in the US. This is the road most visitors become very familiar with as it connects to almost everything. The city streets off this highway through towns like Playa Del Carmen and Tulum, are narrow and feel more so because of the large amount of pedestrian traffic, buses, bicycles and scooters adding to the car congestion. Driving on these streets can be a bit intimidating as well as frustrating if you are in hurry. There are usually many local police on these streets and their main job is traffic control. Don’t worry if you make a mistake and get whistled at. They are just there to get you where you need to be, not to write tickets. These city streets really look much harder to navigate than they really are. Just pay attention and don’t be in a hurry and you’ll do just fine. The rural roads off Highway 307 are mostly paved two lane roads that are fairly well marked and are similar to rural roads in the US. Most of the roads off these paved roads to the smaller villages are often sand and dirt. Foreign drivers should not be afraid to travel these roads but should avoid them at night as much as possible. Not so much for personal safety reasons, but because there are few services, the roads are usually shoulder-less and the poorly lit roads are also used by lots of local pedestrian and bicycle traffic. Having said this, these same roads are what will take you to some of Mexico’s most treasured off the beaten path destinations. Enjoy them for what they are. So what is different? First are the topes, or speed bumps, as they are referred to in the US. Mexico is a relatively poor country and they can’t afford to put police, with expensive radar, everywhere to slow down traffic. They use a much cheaper, and probably more effective method of the topes. Most towns along a roadway will have marked speed bumps of different shapes and sizes, depending on the desired traffic speed. It is common to see topes at rural intersections as well. Almost everyone misses a tope sign at some point and the result is few are ever missed in the future. Round-abouts are another frequently encountered road feature in Mexican towns and cities. These are circular intersections that allow traffic to flow continuously from all directions and work quite easily once you understand one very simple rule. If you are in the roundabout, you have the right of way and others must yield to you. If you are not in the roundabout, you must yield to those who are and wait your turn. Whether you are on the main road or the intersecting side road makes no difference as to right of way. Also be aware, most Mexicans and foreigners not from Europe, don’t really know the rules of the round about, so it is best to just assume the other guy doesn’t know the right of way and be careful! The left turn signal is another unusual feature of driving in Mexico. Unless there is an actual left turn lane marked on the road, drivers wanting to turn left use their left turn signal, but pull off to the right shoulder (yes, with your left turn signal flashing) and allow all traffic from both directions to clear before making the left turn. It sounds a bit unusual but allows better traffic flow on fast moving roads that do not have a left turn lane. Another thing to be aware of is the use of the turn signal as an indication to pass. It is not unusual to see a car, 18-wheeler or bus in front of you turn on their left turn signal where there is no left turn available. This means the driver in front is telling you it is clear to pass. Often they will slide partially off to the shoulder also to indicate it is okay to pass. It is customary to flash your emergency flashers after you pass as a way to say thanks. This is very common practice, but drivers must always be aware of the difference between this passing signals and an actual left turn signal. Just look carefully as you prepare to pass and you’ll get the hang of this very quickly. You will also encounter military checkpoints. These can be a little scary for those not used to traveling the roads of Latin America but they are really nothing to be concerned about. Most of the highways are federal and are therefore under the jurisdiction of the military and the federal police. Checkpoints are usually set up in areas for specific reasons; drugs, out of season lobster, cheap knock-off sunglasses and shoes, or anything else trying to avoid import tariffs, usually from neighboring Belize, who has a friendly trade relationship with China. (what they don’t sell to Wal-Art, I think they sell to Belize) Should you be stopped and asked to step out of your car for an inspection, something very common as you are leaving a beach area or area with airstrip access, just step out and open your trunk. The soldiers might move your luggage, tap on the sidewalls of the vehicle, or possibly even open one of your bags. It is very rare that a soldier would actually go through your belongings beyond just looking into an open bag. They are professional and businesslike, as well as polite. Occasionally you might be asked a few questions and if you are unable to understand, simply say, “no hablo espanol” and “soy tourista” and they will allow you to pass. The check points are really no big deal but for Americans not used to machine gun yielding soldiers at roadside stops, they can be a bit intimidating. They are there for everyone’s protection as well as ensuring the area remains free of any negative attributes. Should you have a car problem along highway 307, you can usually just sit and wait for the green angel to show up. Green angels are emergency roadside vehicles that travel the federal highways to provide assistance to broken down vehicles. Their green and white trucks carry tools, gas, water, universal belts and hoses and all sorts of stuff to help stranded vehicles. They even have tow ropes and will tow you to the next town if need be. So if you have a problem, don’t panic or even worry about walking if you are far from a town. Just wait, an angel will be by before long. So don’t be afraid to drive in Mexico. The Costa Maya area is very spread out with lots to see. Having your own car is the best way to see it all. 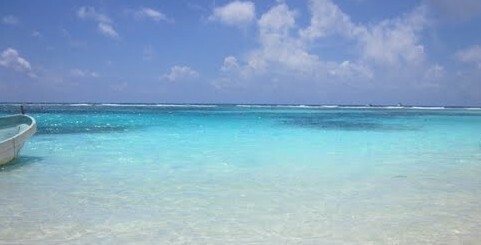 Be sure to check my blog with detailed driving instructions form the Cancun airport to Mahahual. Come on. Don’t worry. It is the very best way to see the Costa Maya area.